How to use iOS Siri to Take to Google Assistance. If you use the iOS device if you want to Google Assistance in your iPhone or iPad you need to open the Google Assistance app and take to the Google Assistance. In new update the in iOS 12 they can be allowed the third party app can also integrate with Apple's personal assistant. Meaning Google can now use Siri to trigger Google Assistant. 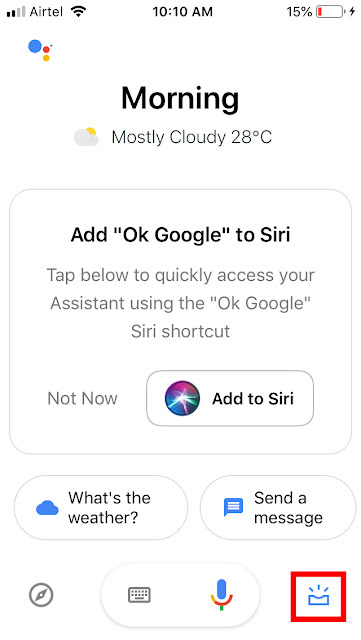 To use the new Siri Shortcut feature in Google Assistant, you'll need to make sure the Google Assistant app is updated in the App Store. After installing the Google Assistance form the iTunes just open the app you should immediately see a prompt to create the shortcut. Tap Add to Siri, then on the next screen tap the red button and say the phrase you want to use to invoke Google Assistant. Sticking with "OK Google" is an easy way to remember the phrase. If you do not see the Create Shortcut option just tap the Box effect icon show in the below image. After tabbing the icon you can see the Siri Shortcut option. Once you're done, you need to invoke Siri, then use the new Google shortcut, followed by your command to Google.